Today marks a big new step in the evolution of The Bowery Boys: New York City History podcast and website as I present our first item ever for sale — a special one-hour audio history tour of Washington Square Park. In this one-hour tour, I present over 200 years of history relating to one of Manhattan’s oldest and most attractive park spaces, a former potter’s field for yellow fever victims that became a magnet for old New York society and a playground for revolutionary artists, writers and photographers. With a cast that includes Henry James, Stanford White, Bobby Fischer, Giuseppe Garabaldi, Edward Hopper, Diane Arbus, Boss Tweed, Jane Jacobs and Robert Moses! 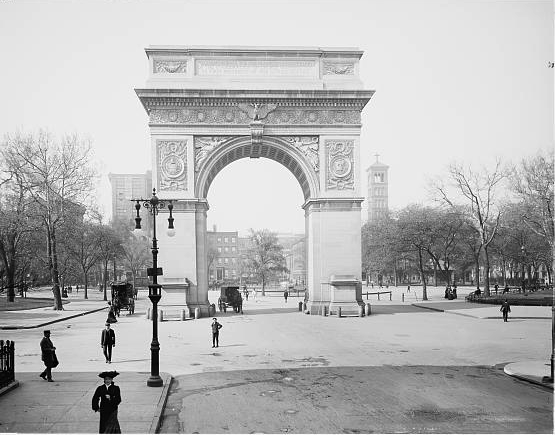 The Washington Square Park Audio History Tour is great for students, tourists and lovers of Greenwich Village history. It’s a tour meant to be listened to while you are walking around in the park; however the amount of ground covered in the tour is relatively manageable, so you can listen in and enjoy even if you’re far away or just looking at the park via Google maps. This audio history is for sale today worldwide and available at a host of digital retailers, for just $3.99 on CD Baby, Google Play and many other retailers. It is also now for sale in iTunes and Amazon, although they have set it at a higher price. No matter where you buy it, most of the income will come back to the Bowery Boys, and we intend to use the profits to upgrade our recording equipment and to begin expanding to scope of our original mission into new, exciting territories. You can buy it directly from CDBaby at the digital store below. While you’re at it, I would appreciate it greatly if you went to either iTunes or CDBaby and wrote a review of the tour once you’ve listened to it. Spreading the word will improve the show’s appearance in search results. If I can sell enough and reach a certain threshold, I will start work again on a second tour. And I’m taking suggestions! If there’s any part of the city you feel would make an interesting audio-guided walking tour, please respond in the comments or just send me an email. And if this wasn’t enough — there’s a new free podcast that will be ready to listen to by Friday! Our topic this month is closely associated with Washington Square Park and should make a nice companion to the audio tour. 2018 Update: Looking for our professionally-led walking tours? Check out Bowery Boys Walks for our new walking tours, developed around Bowery Boys episodes! ← Let us be your Park Avenue Summer Streets companion!